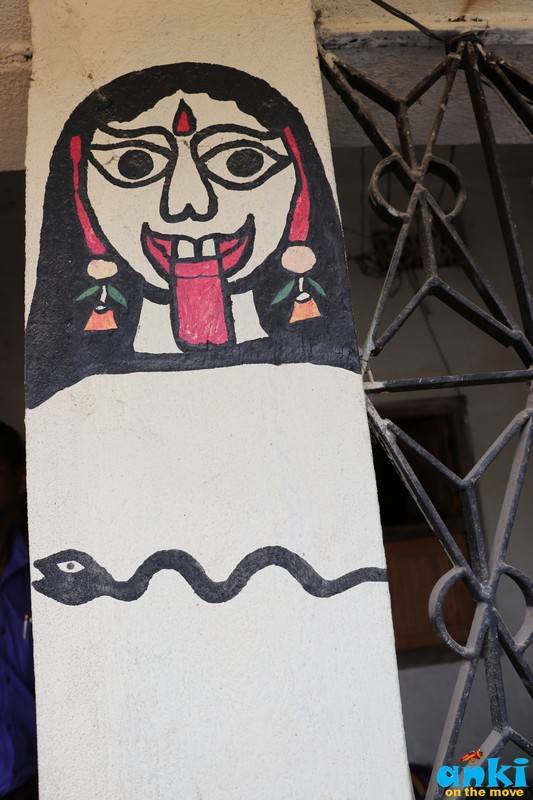 If it wasn’t for Bhaskar Kulkarni’s discovery of this art on the walls of Jitwarpur during the inspection of worst drought and famine in Bihar in 1962, this art would have had been a hidden abode of endless talent. 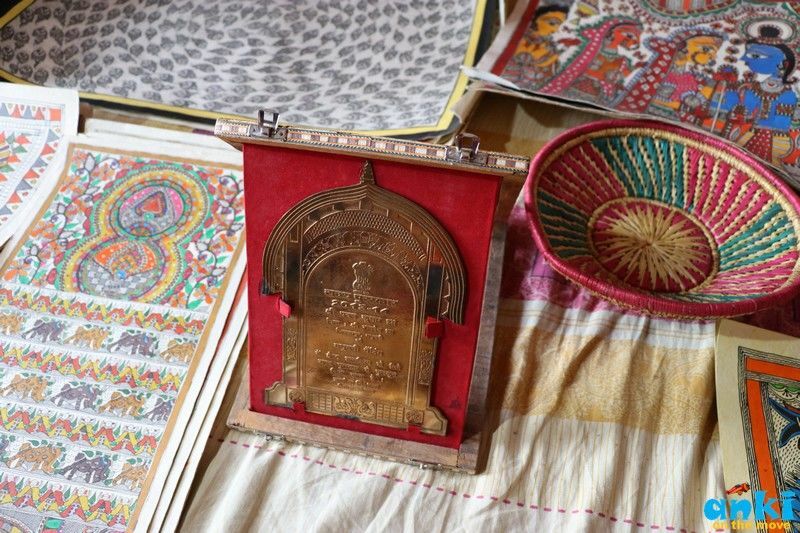 Today, we are talking to two extremely talented individuals and their families on how the journey of their recognition of Madhubani art started , their attempts on reviving the art and how they won the awards! 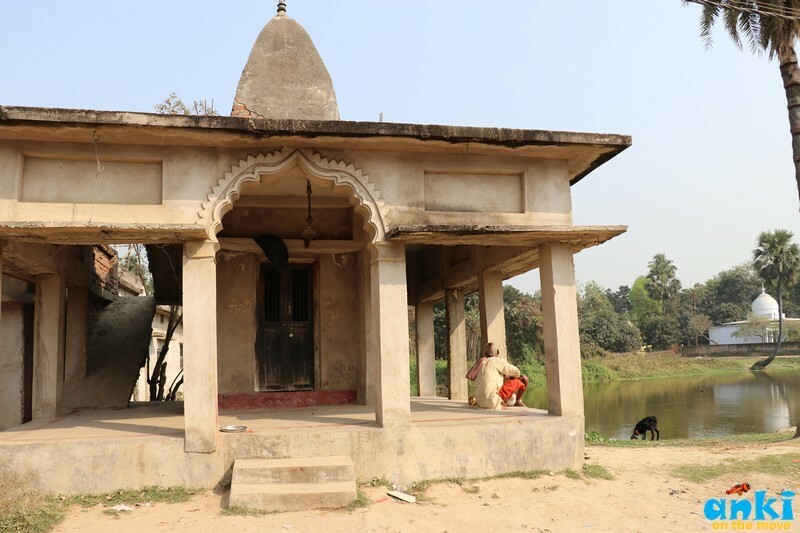 Baua Devi: The renowned Baua Devi from Jitwarpur village has recently been listed for Padmashree. She recalls her early days and her fascination to depicting painting with her mere imagination since the age of 13. 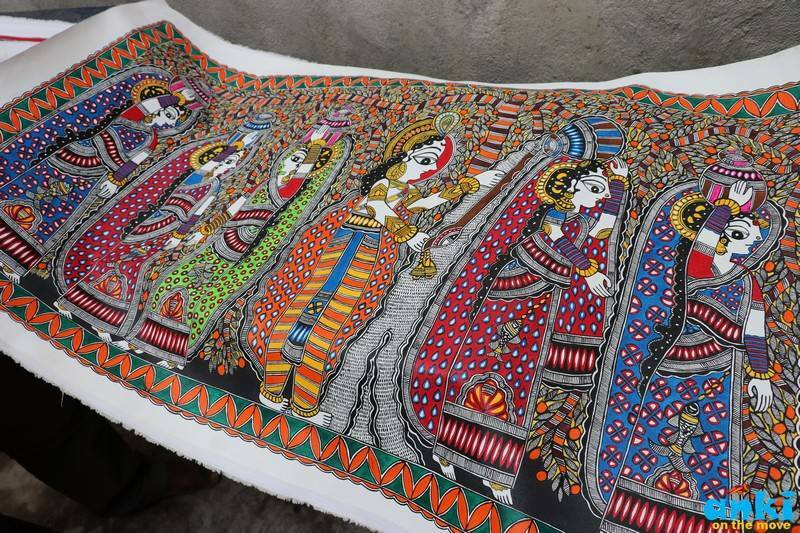 She says “It is our tradition our grandmothers used to make, our mothers used to make madhubani painting during the weddings as they would make Kohber and decorate Mandaps. In 1962, when Bihar had a drought, Bhaskar Kulkarni had come from Delhi for research and came to Madhubani. When he came here, since he was from Delhi and with his camera and bag, everyone was caught surprised by him. This gentleman had come with his cameras and he went to everyone’s terrace and took pictures of Kohber and Mandap and said I have come from Delhi . If I give you guys paper would you draw on it. That time there were more elderly artists such as Chachi Sita Devi, Jagdamba Devi, Yamuna Devi etc. I was 13 years old that time. During those days, the pastime for ladies would be to make sweater etc or to paint. So Bhaskar Kulkarni got us paper and asked us to draw something. Even I drew something on it. And like that he stayed for a week and collected small paintings from many places and travelled to Delhi. In Delhi he went to head office and said that in Bihar, there is a art form and he showed them the paintings and they liked it. So even in next year, they were sent with handmade paper. And we draw one Shiv, one Durga and one Kali and they gave us Rs 14. That was in 1962. Next year he said ‘ Will you come to Delhi, think about it’. So we all 5 we went to Delhi, we were given boards. We worked on it for a month and made paintings. So there were 4 artists from this village and one from Ranti village. We were paid Rs 20/day then and after the painting was over, we were sent back to Patna. So Bhaskar Kulkarni came again and he said that everyone liked it in Delhi, So from Patna Upendra Mahajan was told that you start an initiative with all the artists here and so with 5-6 room home in Madhubani we started a office. 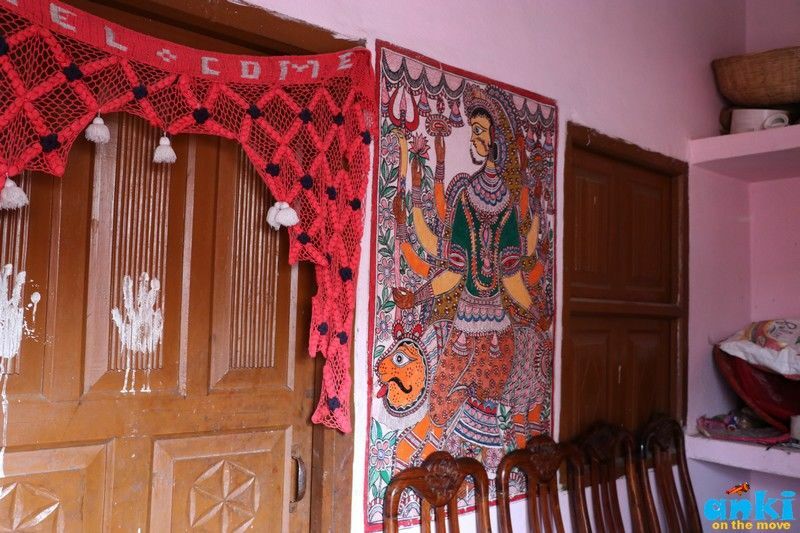 Emphasizing on the culture the village shares, she says “Naag Panchami is our culture, that happens during the month of June”. Dhaan’s lava is made and milk is offered in the hope that the naag remains far away from us and we won’t face any problems. In Science, it is said that Snake is one of the useful insects. snake kills rat and other insects that destroys the crop, so indirectly snake is our helper. Snake hence is seen God in the village. So as a safety precaution, the painting of snake is on our door. 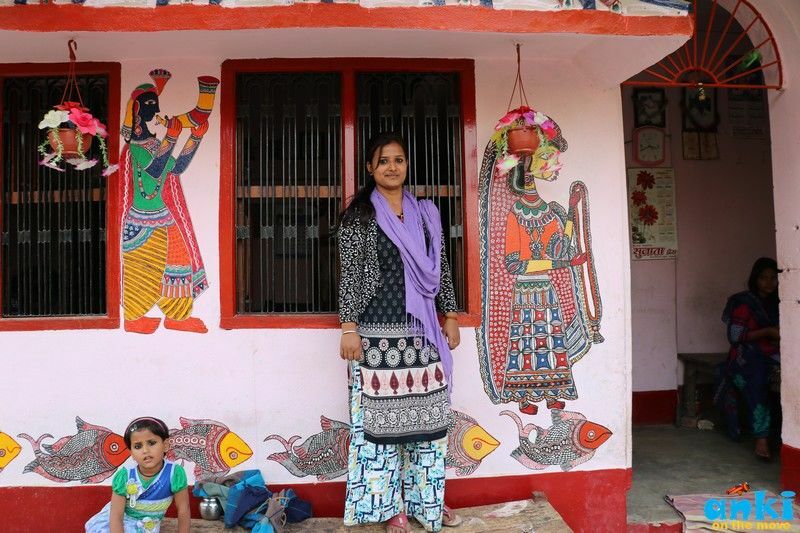 This tradition used to village wide earlier, because earlier there were mud homes so till the time the painting stays, it stays. Now they are tiled home, people are wary of ruining them. 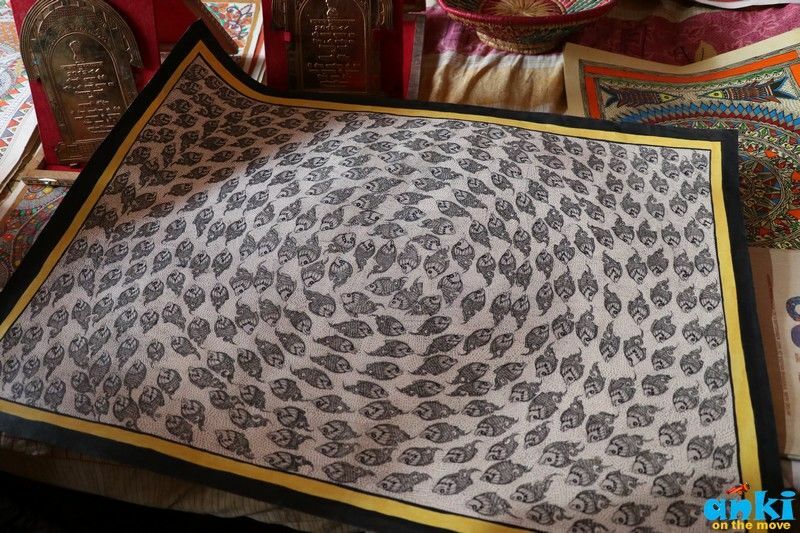 Unlike the traditional art forms, Baua devi’s art is full of imagination and creativity. 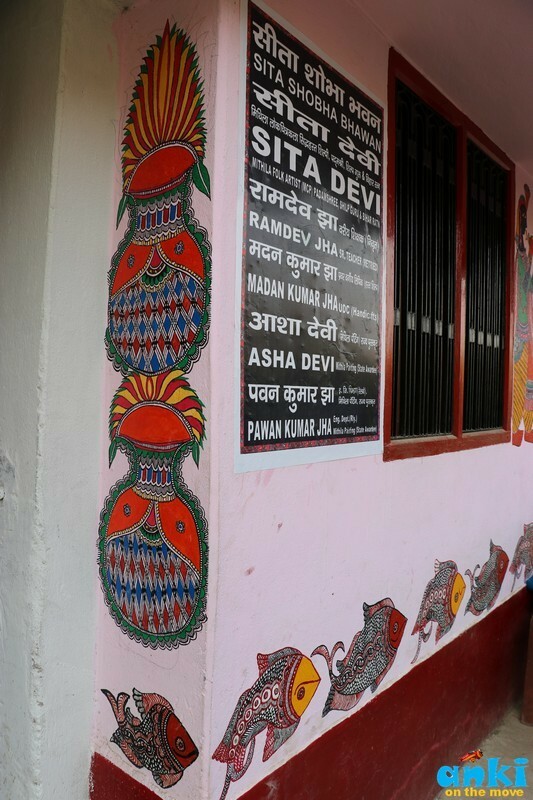 She says Sita Devi, one of the renowned artist had started with Radha Krishna in those time, she hadn’t seen the lord but she made by her own imagination. People started copying that. Today there are lot of copies of Kohber, Raam Sita, Ramayan and Mahabharata - everyone is making them. But she also says not everywhere Kohber would work. Colors pop in her art! She continued “I also paint stories. Like how Bhaskar Kulkarni came, how he chit chatted, talked, that also I have drawn on a painting. 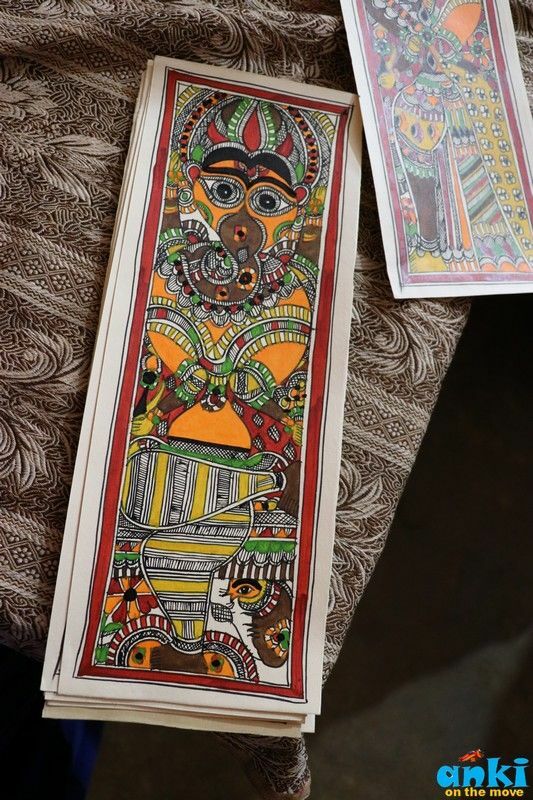 Like when the daughter of Birla Rekha Podhar came- she gave me a theme on how the madhubani painting developed and I painted that. And that painting is today’s in British Library. I make whatever comes in my mind - there are no maps with me - just my imagination and feelings. Today the paintings are so famous, that, even if she makes a piece it gets sold very fast. Themes like Sursa ( When Hanuman came in Sursa roop) , Naag Kanya(which is very famous in America), Garud painting (legend has it that when lord Krishna was playing , then when he went to get his ball back, the snake has surrounded him so Krishna plays flute and Garud comes). 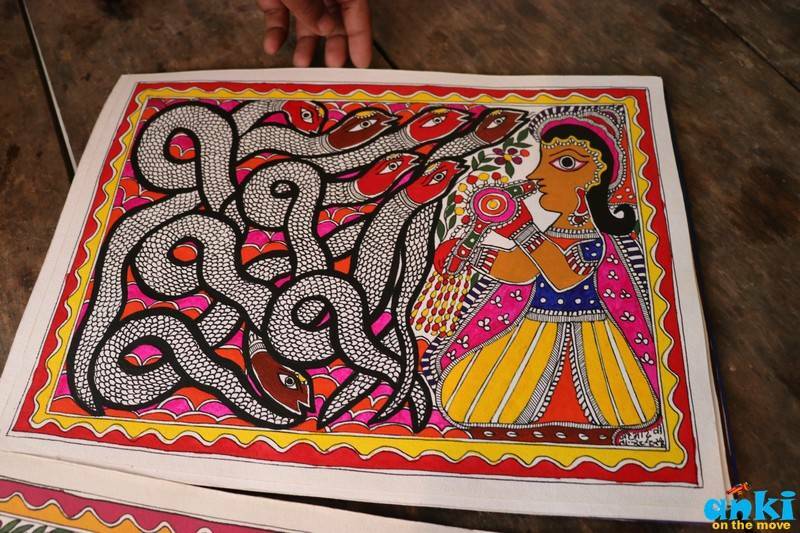 There are also songs with Madhubani art. When one does not feel like, we do not make it. We make it with heart. 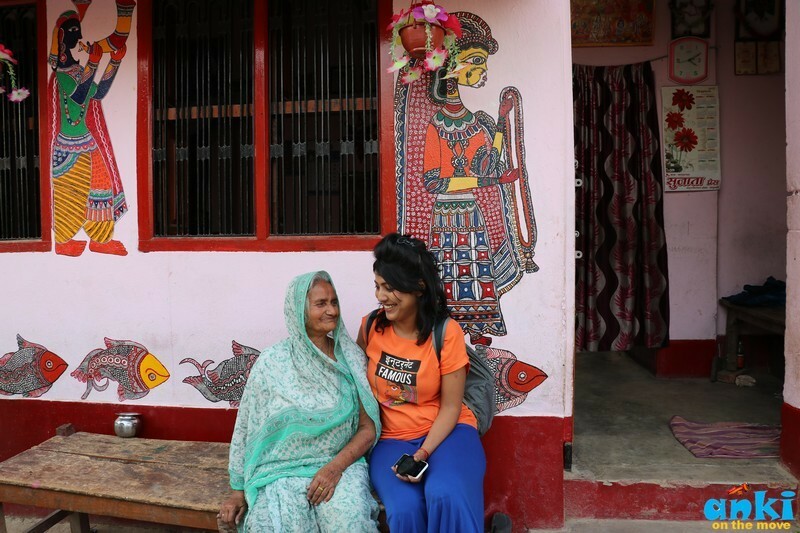 She says.She then recites one of her songs that goes with Madhubani Painting. 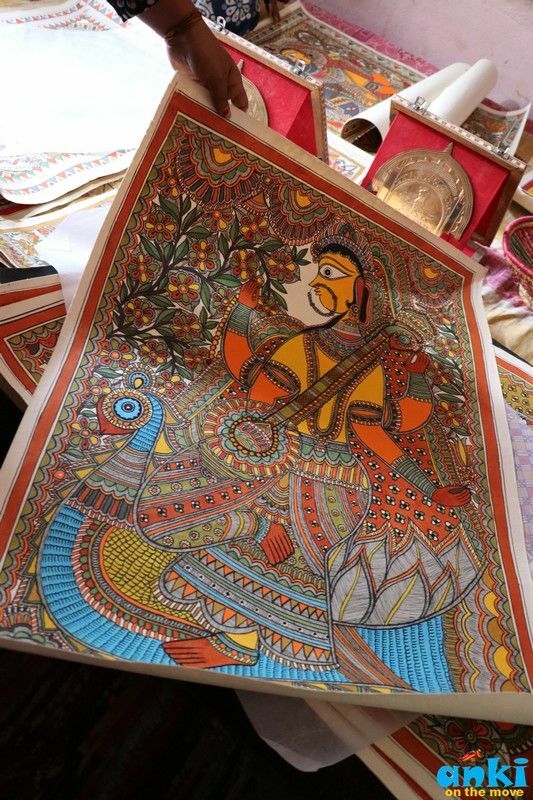 Her passion and love for Madhubani art goes beyond words - it sings! Of all the artists that we have have who has one awards, the technique is unique for each. 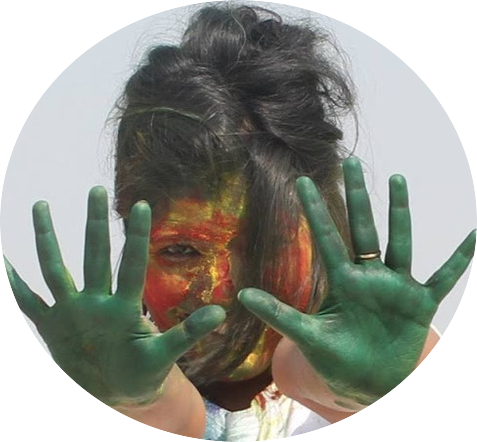 While Sita Devi used to do color painting, the base color for Jagdamba Devi was Vegetable Color. Gangadevi from Rasidpur had line work and no color. 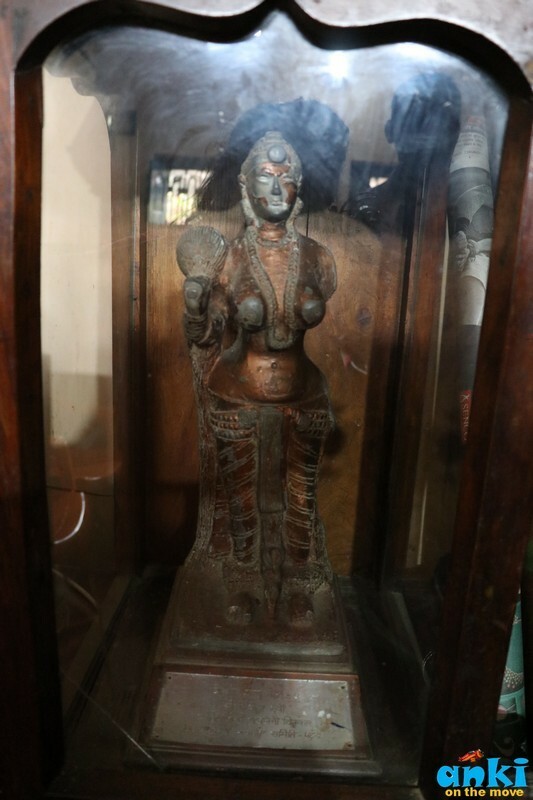 Ranti's Mahasundari Devi was color on clothes. etc. 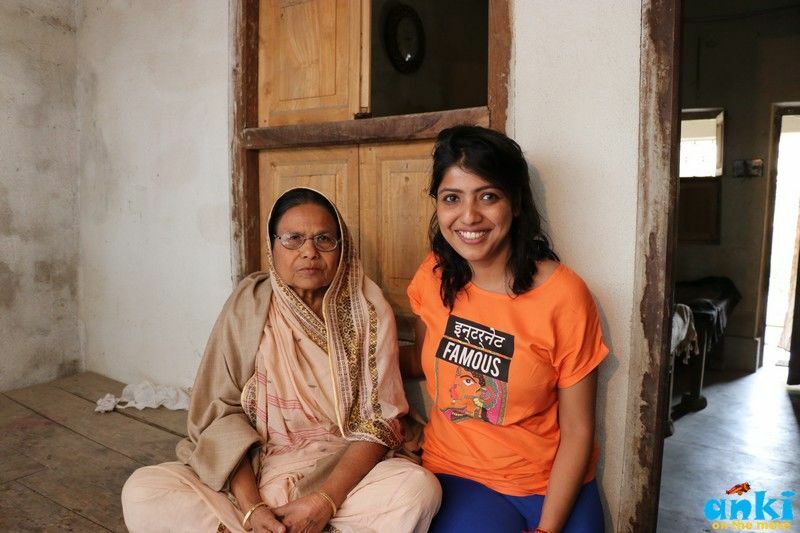 So we decided to get into home of Padmashree Awardee Sita Devi . 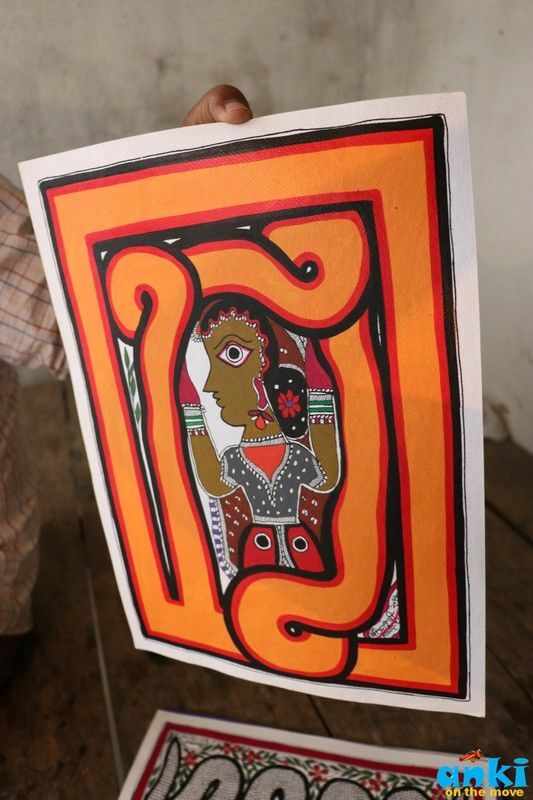 We met Mithilesh Jha (09973734238), his grandson and their family who are carrying forward the tradition of this art. 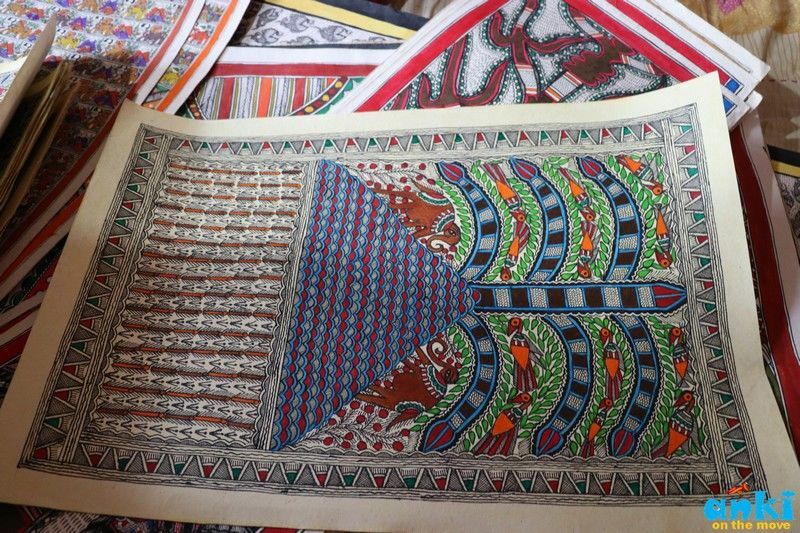 He says ‘.Madhubani Painting was in the village of Mithilanchal even way before 1962. It used to be on the walls of Mithilanchal, even our grandmothers used to make and even in Ramayan it is mentioned during Sita’s shadi. 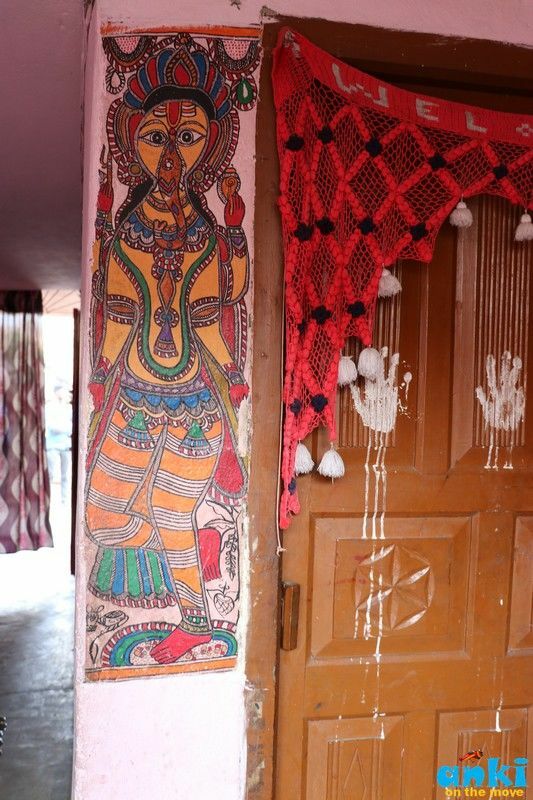 During weddings, after washing the wall with cow dung, simple paintings such as Kali Ji, Durga Ji etc used to be done. 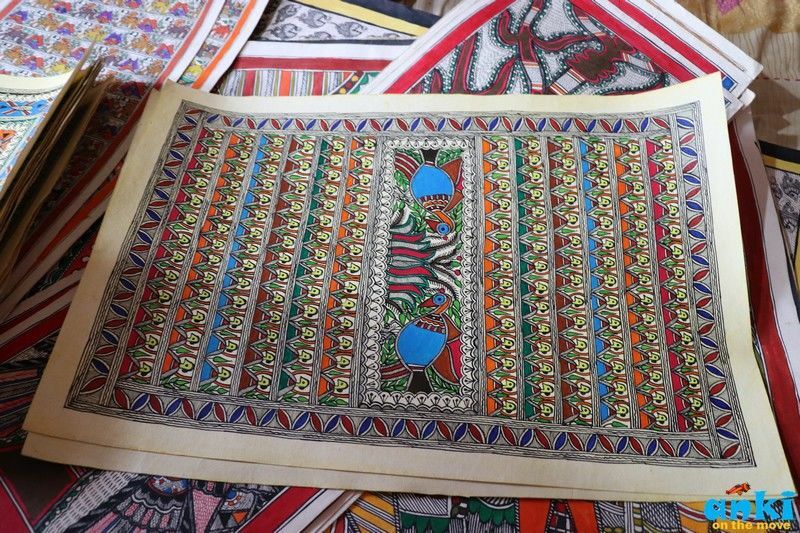 Earlier Madhubani was famous for just two handicraft items - they used to make Tokris with Seekhi grass and Chakra Sut where they used to make wool with cotton, nobody however would pay attention to the walls. So when Bhaskar Kulkarni was sent to Patna by Pupul Jayaker (Pupul Jayakar née Mehta was an Indian cultural activist and writer, best known for her work on the revival of traditional and village arts, handlooms, and handicrafts in post-independence India ) who was chairman of Handicraft then to access the situation of drought , he came to DCP’s place in Patna and in the office of the DCP was a mud vessel on which the painting was there. This painting was usually done by Brahmins and kept in Bride Grrom’s room. Bhaskar Kulkarni having the designer mind, saw those mud vessels and asked where it is made. He was told ‘This is made in Mithilanchal, it is considered Auspicious there’, So he came to Madhubani and bought a cycle and cycled on the road which that time was mud roads. So when he came to Jitwarpur where the festival was going on and the ladies had gathered to make paintings. My grandmother was then painting on the door. Bhaskar Kulkarni saw it and just as he saw it, he stopped his cycle and he went close to where my grandmother was working. 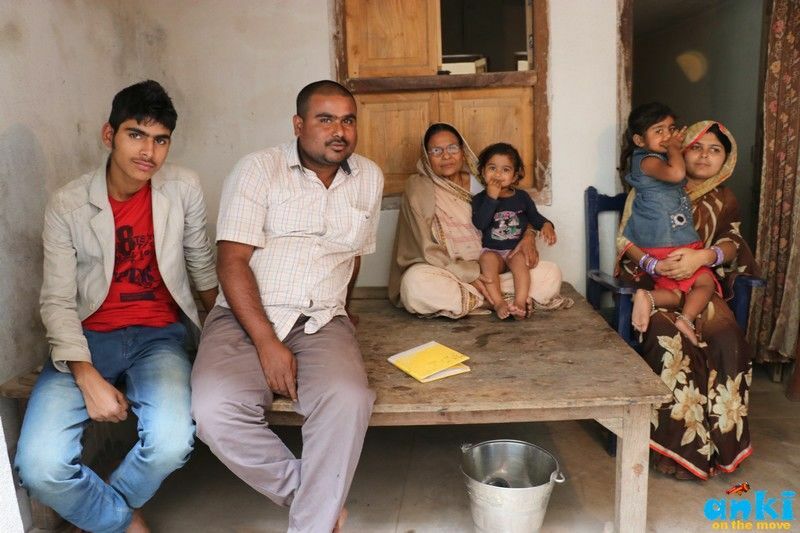 That time there was a lot of Chuachut (untouchability in the region) . Ladies were not allowed to talk to her Man’s brother, not allowed to venture out and there was pardah. The elderly folks hence almost threw him out, my grandfather asked him why had you gone towards the terrace. 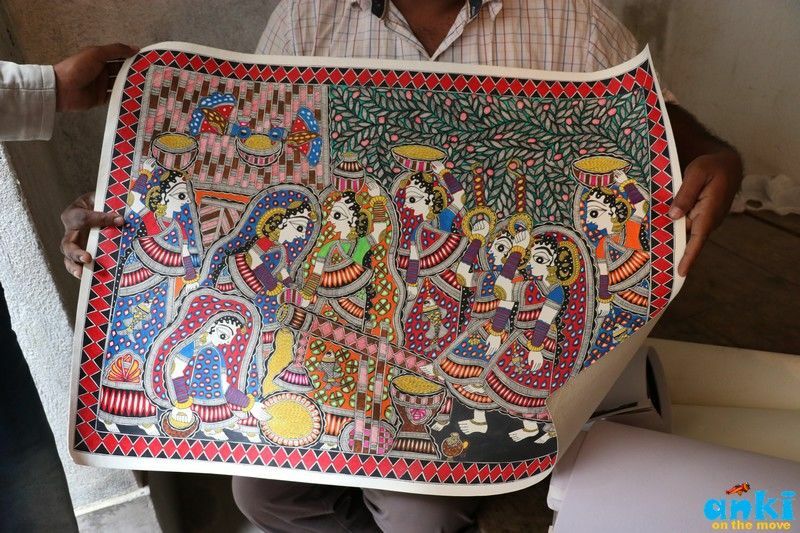 Bhaskar Kulkarni replied ‘ This money is relief fund, I have to go to where these ladies are making painting. ‘ He got an idea that since this is relief money why not use it for paintings, and do an exhibition with it to know what is the future of this art. So he said in the same way as these ladies paint on wall, I will give them the paper, let them draw on it. So gave three grades (A),(B),(C) depending on the painting : For A he gave Rs 3, For B Rs 1.5, For C grade( 0.75 Rs). So my grandfather also helped and 10-15 ladies were distributed the raw paper made in Pune. How did Handmade Paper got its name? So, how does Handmade Paper gets it name? I found the answer quite surprising. In earlier days, paper was made on Chakla Bellan and with Hand. That time it was very poor, like people used to eat just one meal in a day and would sleep by drinking just water during nights. So money started coming in due to art.. Pupul Jayakar who was Indira Gandhi’s adviser, she told about the art and so slowly and slowly ladies and men got into this art. 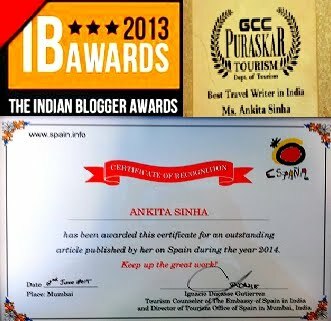 So they held exhibition at many places, So my grandmother was awarded 4 times by Bihar Sarkar. In 1975, she got national award. In 1976, USA was celebrating 200 years of Independence, it was when India Government was asked if they could send 13 artist. So, madam Pupul Jaykar got one person from each state. My grandmother was also invited to come. 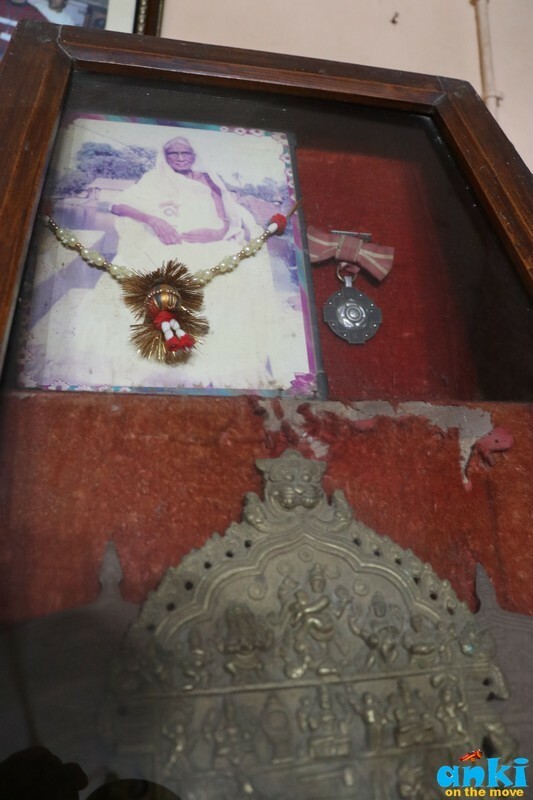 That time there was untouchability in Mithilanchal. The women used to wear Gunghat and was not supposed to talk loudly, not to get out etc. My grandmother said she cannot go ' If something happens, there won't be anyone to bring back my grave'. There was so much untouchability in Mithilanchal, that even if a shadow falls, it would be scolded. So Pupul Jaykar and Indira Gandhi tried to convince that this gentleman is like your son, but my grandmother persisted that she will not go without her son. She said my son does color combination so he could also help me with art. I won't go alone so cancel my name. Then there was a head meet of 13 people and my grandfather also got selected. He was then a primary teacher in Mithilanchal and Indira Gandhi suggested that you leave the school there and join Baal Bhavan in Delhi which will also be helpful because Pragati Maidan has exhibitions where you can accompany your wife in exhibiting the art. My grandfather thought 'Oh she is asking me to shift to Delhi, but I have my whole family and friends here, I cannot'. So he said took leave from the primary school and flew to America with my Grandmother. There was a theme in US then on the art, which was based on old life and new life. There were also representatives of many counties and they thought if we can select a few and take them to our country and showcase it that would be great. That time with my Grandmother, the famous Bollywood singer Mukesh was also there for his program. There were artists from all over the world from France, Germany, Berlin, Russia etc but my Grandmother was selected among the 4 selected out of 13. So my Grandmother went to France and she was making Painting where one of the writers came and saw it. 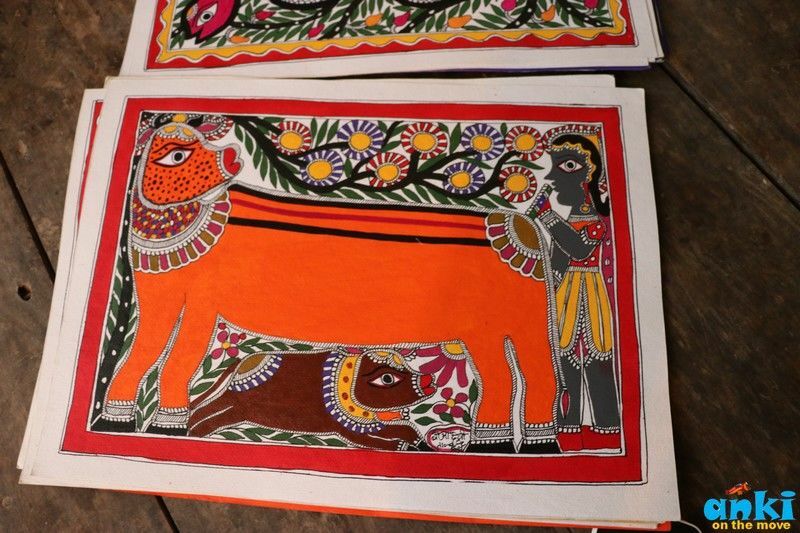 He came along with my Grandmother to India where he stayed with us from 1976 to Jan 1977, and released a book called the Art of Mithila. He later made a documentary on how marriage happens in Mithilanchal. So my Grandmother used to go to Pragati Maidan for Exhibition. In 1981, my grandmother made painting in Ashoka Hotel Delhi in the same way, first washing it with cowdung paste and then painting on it. Indira Gandhi saw the paintings in 1981, and my grandmother was selected for Padmashree. In 1984, she won Bihar Ratna. In 1989, there was one Japanese Tourist who had come here, stayed here for 2-3 months, collected some paintings from here and sold in Japan. Those were instant hit and he made so much profit, that he thought why not capture the daily activities of Mthilanchal and get it inaugurated by Pupul Jaykar and Sita Devi. 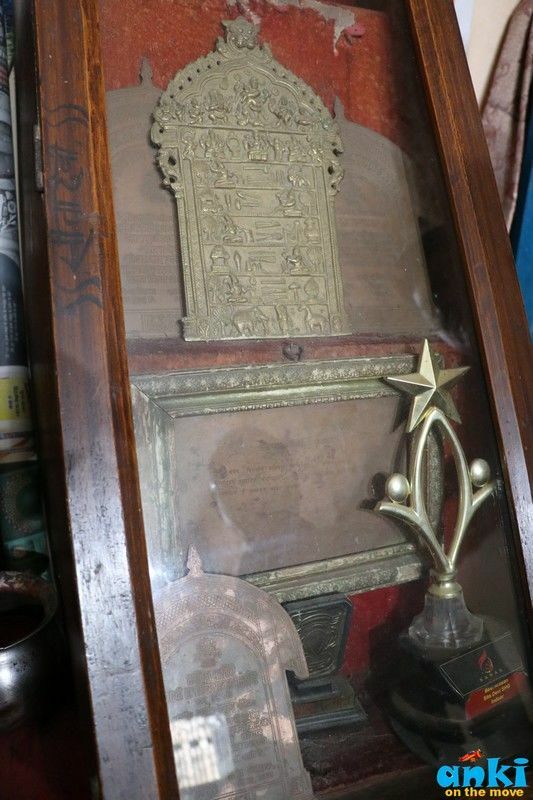 He took all the old things from here ( wooden doli, dhaan kutne wala etc) and he shipped everything and started a museum. That museum is called Mithila Museum in Tokyo. So my grandmother went to Japan in 1989 for 4 months. In 1984, Amitabh Bachan and Sita Devi both got awards together. That time the advisor was Usha Bhagat, she told my grandmother, he is a great actor, you could get your picture clicked with him so my Grandmother said, I got all the awards before him, you are telling I should click my photo with him! Amitabh Bachan understood that Sita devi got angry. Then Amitabh Bachan said sorry and my grandfather was invited to their home and he said that during the tea time, I would love to get the painting done at my home. The Problems artists face today! 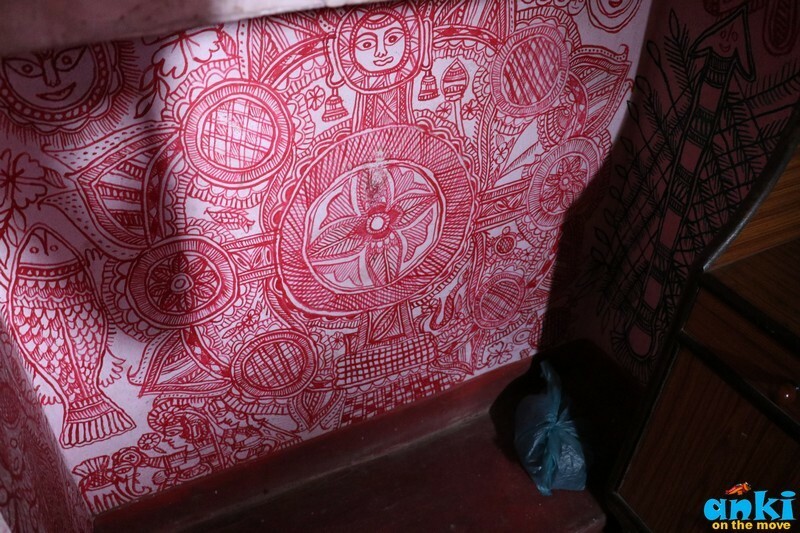 The problems these artists face today is in the art that costs Rs 3500 , the middle man gives around Rs 700 after many months of chasing them, sometimes even a year. He said to make one painting the labour cost comes out to be Rs 300/day. So for a painting that can be done in 4 days, we must ideally get Rs 1200, but we get 5% of what we make. When we asked him, why not sell directly online, he said the middle man has become so famous that who will take from us! 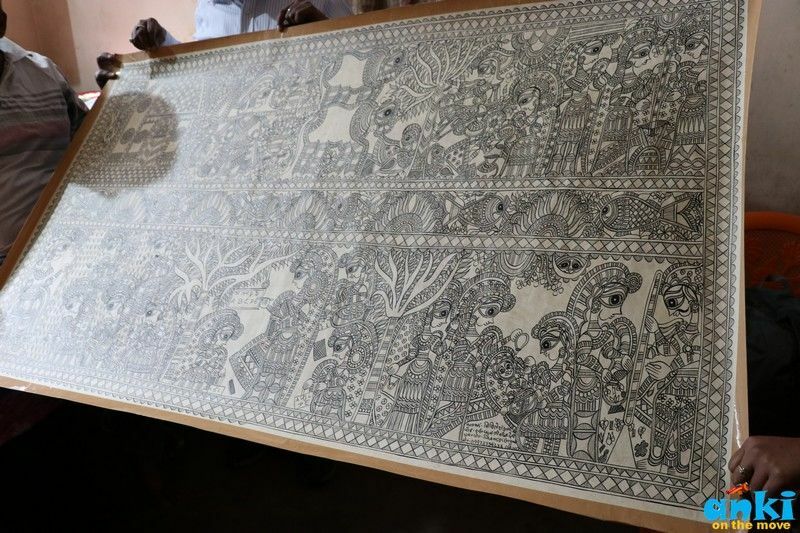 Plus there are so many copycats, that people would xerox the line drawings and paint on them and sell them..
Madhubani is known as free hand drawing but the appreciation of art or artists in our country falls flat. 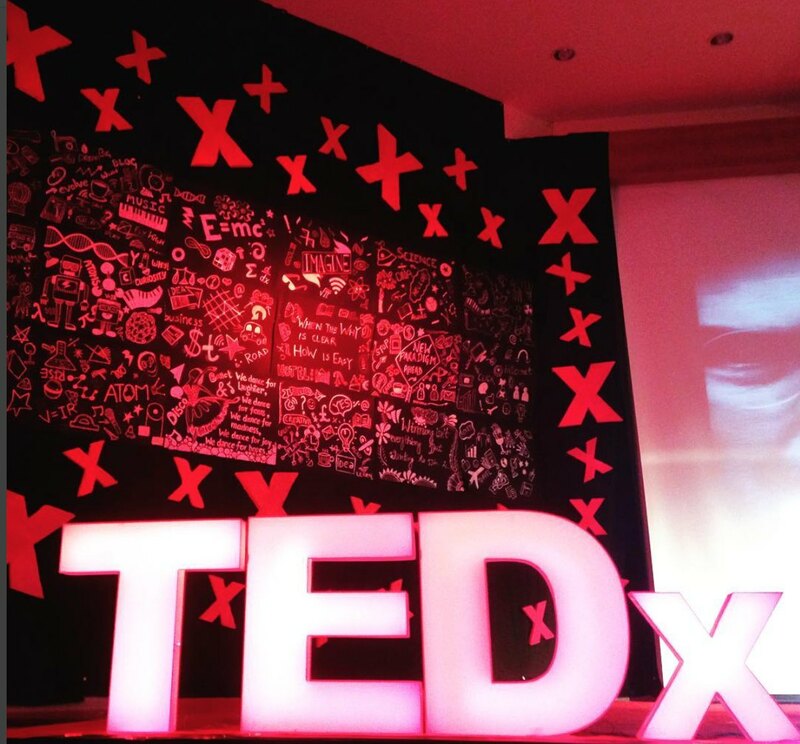 Even some NGO's add their name to the art and sell them in their name in exhibitions. 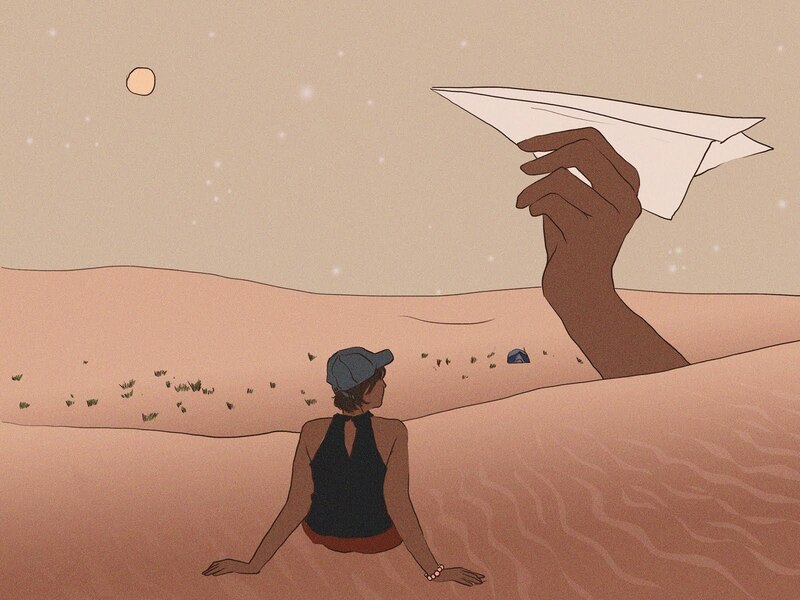 Looking at in how much apathy these artists live, I hope, and wish that government awakes, and gives these artists their due share someday, so that the art thrives. Vlog coming on next post! Hi Anki, we are planing to visit Bihar and want to spend a couple of days in the Madhubani region. 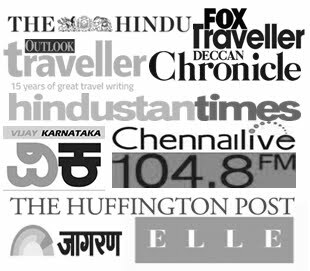 Do you have any recommendations of where to stay ? 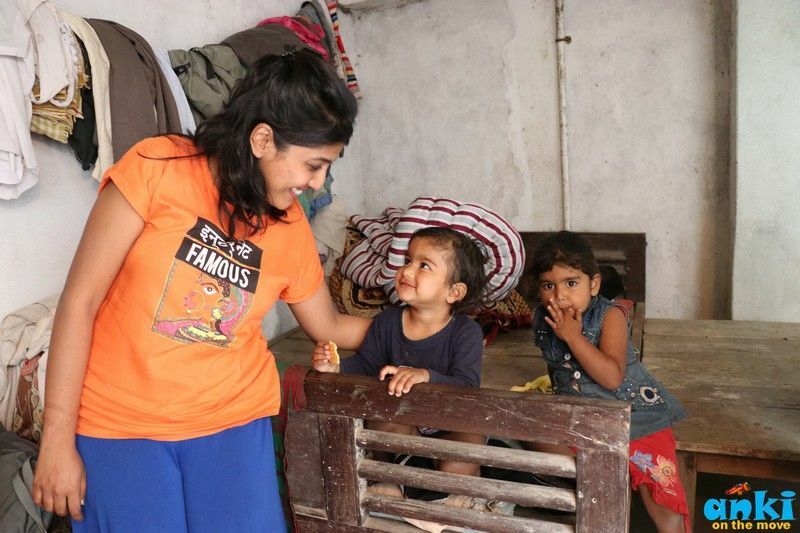 Are there any homestays in any of the villages ?